A few people have had trouble signing up for the WinterWalks mailing list. If you are having trouble, just email me and I will send you an invitation to join (I can't add people directly anymore). Check out the picture from Mount Wachusett this afternoon. Opening tomorrow maybe? If you DID NOT receive an email from the WinterWalks email group, then you are not a member yet. You can subscribe by going to AdventuRides.com and signing up in the box in the upper righthand corner. While it is called "Winter Walks" it is intended to be used to announce events such as Downhill Ski, XCountry Ski, Snow Shoe, and even Walks! Any group member can post events of interest to winterwalks@googlegroups.com. You can unsubscribe by sending email to winterwalks+unsubscribe@googlegroups.com. Mount Wachusett opens tomorrow (probably)!!! The Fall biking season continues on, although it looks like Monday could be the end :-( I attached a picture from last Friday's ride. The forecast calls for Mostly Cloudy :-( but relatively warm :-) It should be mid 40s when we leave and mid 50s when we get back with little wind. So I thought we could start in East Pepperell Center and do a tour of Mine Falls Park in Nashua and then have lunch at Dolce Italian Grill in Pepperell. The route will take us across the new covered bridge and on to the Nissitissit River and UP to views from Blood Road on the border with Hollis before we descend to follow the Nashua River to Nashua and back. I'm not planning to actually go into downtown Nashua, but just stay in Mine Falls Park for almost 5 miles of easy, car-free off road. 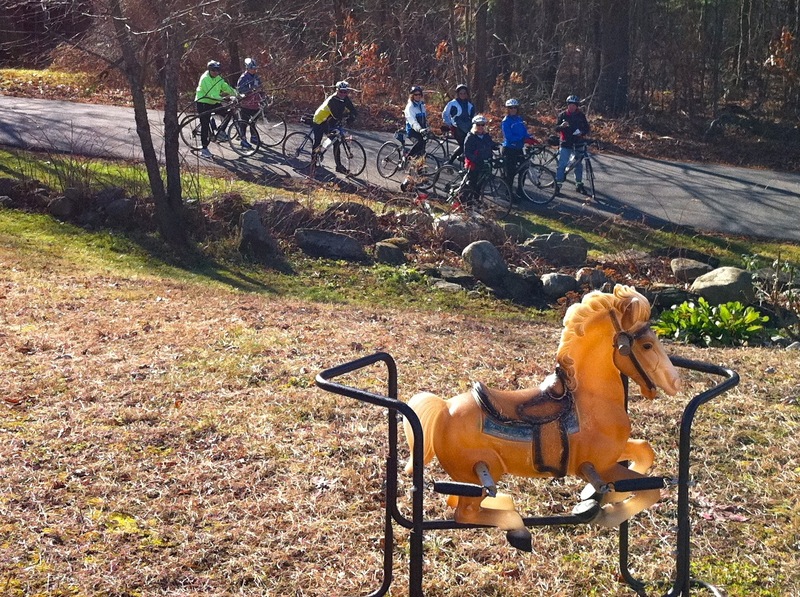 After a flat but boring trip on Route 111, we will take the newly reopened Nashua River Rail Trail back to East Pepperell. 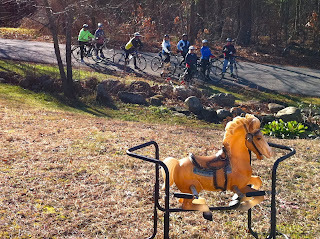 The "Extra Innings Ride" will leave East Pepperell Center at 9:30 AM. Route Map - East Pepperell - Mine Falls Park. Elevation Gain - 350 feet (about as easy as you can get in NH). Unpaved - 7 miles (very smooth). Equipment - I think I will bring my hybrid bike, just for the heck of it. AR Index - Roughly 27 flat, paved miles. Lunch will be at Dolce Wood Fired Italian Grill in Pepperell. It looks like good weather on Friday and it is Ellen's Birthday! So I am planning a 23 mile-ish ride around Lunenburg with lunch at Bangkok Hill Thai Restaurant (yummy).